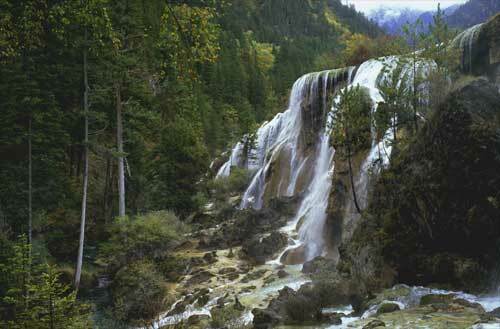 Pearl Shoal Falls is one of the many waterfalls in JiuZhaiGou valley, northwest of SiChuan province. Named for the 9 local Tibetan villages. Here is a place of natural wonder, waters; woods, snowcapped mountain peaks, interesting local minority cultures and customs. Serene and somewhat untouched. JiuZhaiGou is known for its natural beauty.